Much attention has been given in the literature to the effects of astrophysical events on human and land-based life. However, little has been discussed on the resilience of life itself. Here we instead explore the statistics of events that completely sterilise an Earth-like planet with planet radii in the range 0.5–1.5R⊕ and temperatures of ∼300 K, eradicating all forms of life. We consider the relative likelihood of complete global sterilisation events from three astrophysical sources – supernovae, gamma-ray bursts, large asteroid impacts, and passing-by stars. To assess such probabilities we consider what cataclysmic event could lead to the annihilation of not just human life, but also extremophiles, through the boiling of all water in Earth’s oceans. 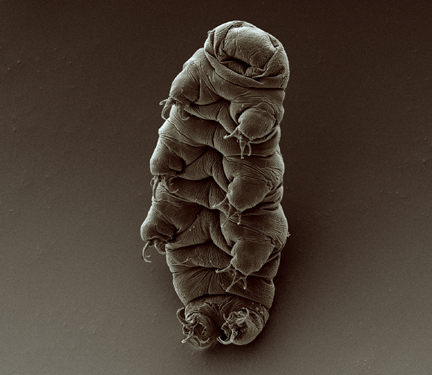 Surprisingly we find that although human life is somewhat fragile to nearby events, the resilience of Ecdysozoa such as Milnesium tardigradum renders global sterilisation an unlikely event. Out of the astrophysical sources of complete global sterilization mentioned, which would be the most likely to occur? Not sure. The article discusses a bit about probabilities but doesn’t come right out and compare them like that.